This gift voucher will provide you with the opportunity of a lifetime - to swim with wild dolphins in the waters off Adelaide! Come face to face with these highly intelligent creatures as we take you out on our 58-foot sailing catamaran departing from Holdfast Shores Marina in Glenelg, located just 15 minutes from Adelaide's CBD. You'll marvel at the antics of these amazing creatures as you swim and play right alongside them for over an hour! 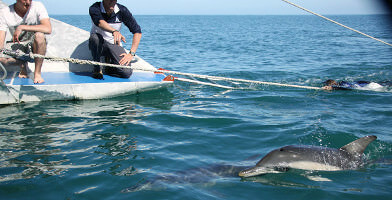 Travel out to sea from Adelaide aboard a 58ft sailing catamaran for the chance of a lifetime - to see dolphins in the wild! 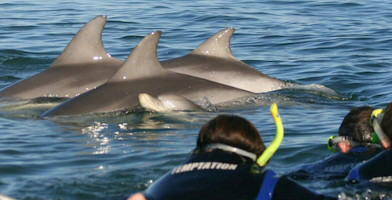 Give the gift of a dolphin watching cruise with wild dolphin swim with this incredible gift voucher experience. Find out more information here.